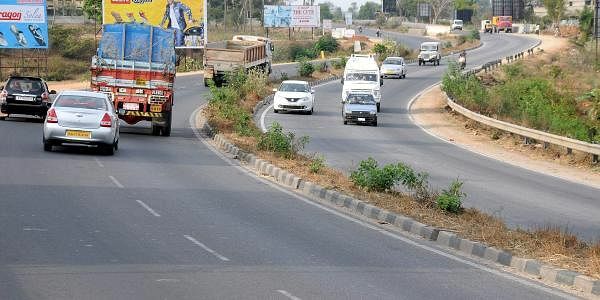 The National Highways Authority of India (NHAI) is making the Bengaluru-Mysuru Highway (NH 275) with 10 lanes, including a six lane expressway. BENGALURU: At least 800 trees, some over 100 years old, will be axed to widen the Bengaluru-Mysuru road. This project is expected to bring down the travel time between the two places from three hours to just around 90 minutes. The National Highways Authority of India (NHAI) is making the Bengaluru-Mysuru Highway (NH 275) with 10 lanes, including a six lane expressway. A tender will be called by March end and work is expected to start by April or May. Once the project is completed, 117km between NICE Road entrance in Bengaluru and the Ring Road junction (near Columbia Asia hospital) in Mysuru can be covered in 90 minutes. It is estimated to cost around Rs 4,100 crore. According to Jhalendar Kumar, Project Director, NHAI, the land acquisition process in Bengaluru is almost complete. Some 1,300 acres worth Rs 2,400 crore had been identified. Of the 1,300 acres, 1,100 acres are private property. “We have already started giving money to the owners, including farmers,’’ he said. Jhalendar added that they have identified around 800 trees that need to be cut for the project. “However, it is the forest department that has to give the final approval,’’he said. He also said that the bidder has to plant two saplings for every tree that is fell. In 2016, a tender floated by NHAI for the project had some technical issues and was therefore cancelled. According to NHAI officials, this is a developer-friendly project. NHAI is expecting many bidders this time. Under this proposal, the government of India will fund 40 per cent (Rs 1,640 crore) of the project cost and the remaining will be given by the bidder (Rs 2,460 crore). Of the Rs 2,460 crore, the bidder will take 70 per cent loan from a bank which will be repaid by the government of India in 30 instalments. The same will be placed before the Public Private Partnership Appraisal committee of the Infrastructure Ministry for approval. Once this gets a nod, a tender will be floated by March end and by May end work is expected to start. Its a 24 months project.